The second type of advanced coal-burning plant, the IGCC plant, is based around the gasification of coal. Coal gasification is an old technology. It was widely used to produce town gas for industrial and domestic use in the USA and Europe until natural gas became readily available. Modern gasifiers convert coal into a mixture of hydrogen and carbon monoxide, both of which are combustible. 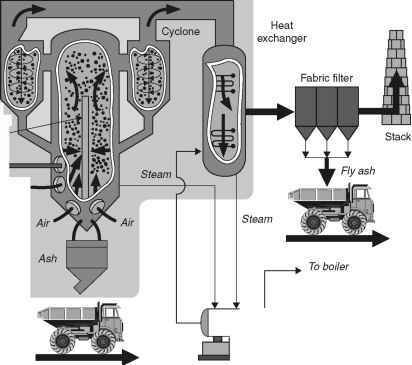 Gasification normally takes place by heating the coal with a mixture of steam and oxygen (or, in some cases, air). This can be carried out in a fixed bed, a fluidised bed or an entrained flow gasifier. 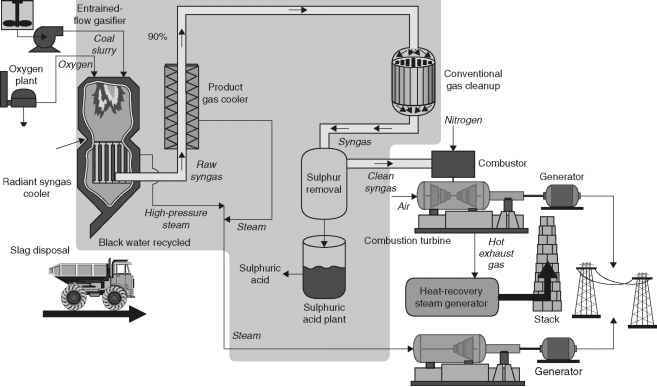 The process that takes place in the gasifier is a partial combustion of the coal. Consequently it generates a considerable amount of heat. This heat can be used to generate steam to drive a steam turbine. Figure 3.5 Flow diagram of an IGCC plant. Source: Tampa Bay Electric Company turbine is used to raise additional steam for power generation. This is the basis of the IGCC plant. An IGCC power plant can achieve an efficiency of 45%. In addition it can remove 99% of the sulphur from the coal and reduce the emissions of NOX to below 50 ppm. Several demonstration projects were built in the mid- and late 1990s, with unit sizes up to around 110 MW. Since then a small number plants have entered commercial operation. Three are in Italy where they burn high sulphur residues at oil refineries. Like these Italian plants, most applications are in niche markets such as the oil refinery or chemical industries. The technology has yet to make an impact in the main power generation market. 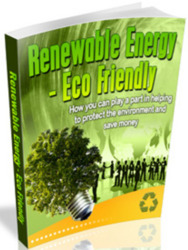 Further development is required to enable gasification to realise its full potential. This will include effective technologies for cleaning the hot exhaust gas before it enters the gas turbine stage of the IGCC plant. Hot gas cleanup will allow an IGCC plant to operate at optimum efficiency. One aspect of gasification technology which has attracted recent attention is its ability to produce gaseous hydrogen. If an energy economy based on hydrogen ever evolves, then coal gasification could provide one source of the fuel. Another area that could prove attractive is underground gasification. This involves the controlled burning of coal in the seams underground where it is found. Air is injected through a borehole into the seam and the gasification product is extracted from a second borehole. Underground gasification avoids many of the pollution problems associated with coal combustion while requiring little advanced technology. However the technique is nowhere near commercial application.